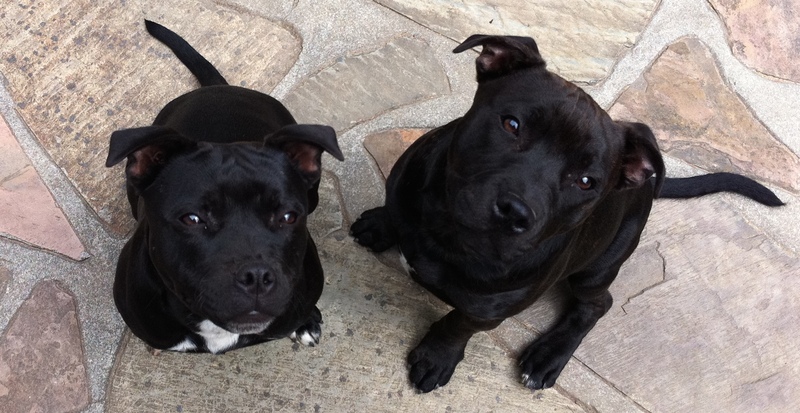 Tamo and Stella are our two Staffordshire bull terriers. I grew up with staffies. From as young as I could remember my parents had staffies. They bred with them occasionally. One of my fondest memories as a child was playing with the puppies. I remember I could not wait to get home after school so that I could play with them. The minute I picked up a puppy I could feel how all my worries disappeared and how my heart started to fill with love until it wanted to burst wide open. Unconditional love – No matter how long I’ve been away they are always happy to see me. They don’t interrogate me before they show me love. They surround me with love the moment they see me. They don’t care if I’m rich or poor. All they care about is that I’m with them. Happiness– When they are happy they wag their tails. The tempo of the tail wagging depends on how happy or excited they are. The amazing thing is that just by looking at their waggling tails I start to smile. The pure expression of their happiness is contagious. Compassion – Whenever I am sad I would go and sit with one of my dogs. When I look in Tamo’s eyes it feels as if he can see right into my sadness. He does not run away or try to take it away he sits with me and stays with it. It feels as if he understands my suffering. Protecting your borders –When they feel as if their territory is being invaded they will bark and try to protect it. If they can sense that you mean well they will back off and welcome you in their space. We all have borders that we build around ourselves in order to protect us. Healthy borders are necessary for our emotional wellbeing and nourishing relationships. But boundaries or borders that are too set in their ways may at times hinder us from welcoming love into our space. Awareness – Tamo and Stella can be sleeping peacefully on their ‘mandjie’ (their big cushion) but the minute they hear a sound that sounds suspicious they will get up and inspect the surroundings with tails that indicate high alert. Once they’ve established that it was a false alarm they will stroll back to their ‘mandjie’ plonk down and dose off again. They don’t continue to wonder about it or try to think about ‘what if…’ or work out different scenarios. They have the ability to be aware in the moment as it is.